Social Security has a flat 6.2% tax rate, up to the maximum wages covered by Social Security ($117k in 2014). Social Security benefits bear some positive relationship with your covered wages and the amount of taxes you paid on those wages. The higher your covered wages, and the higher the 6.2% Social Security taxes you paid, the higher your benefits. 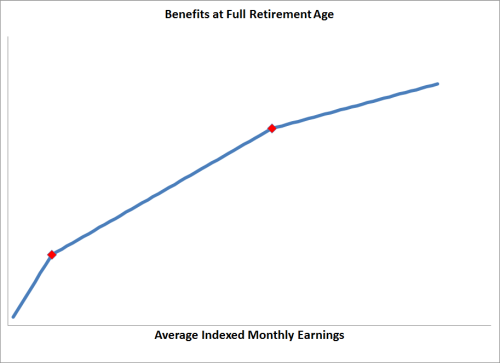 Social Security calculates benefits using your average earnings over 35 years. If you work less than 35 years, the rest of the years will be filled with zero. Therefore, up to 35 years, the more years you work, the higher your average earnings. Retiring early, before you have 35 years of working history, means that your Social Security benefits will be lower. However, it’s not a straight line. You get more credit for your earnings at the lower end than you do at the higher end. The points at which the crediting percentage changes are called bend points. There are two bend points. The first one is set low ($816/month in 2014). For most people, the second point is the more meaningful one ($4,917/month in 2014). After your average earnings over 35 years reaches the second bend point, for each dollar in additional average earnings, you get less than half as much in Social Security benefits as before (15% vs 32%). Think of these bend points similar to tax brackets. If your extra income gets into a 70% tax bracket as there once existed, you don’t have much incentive to earn the extra income. Similarly, if your earnings history already put you beyond the second bend point, you are not getting as much bang for your additional years of work as far as your Social Security benefits are concerned. If you think of your Social Security tax as forced savings for your own retirement, which it isn’t, after you reach the second bend point, you are definitely paying for other people’s retirement for the most part. If you stop working after you reach the second bend point, even if your future earnings are zero, you are not losing much in Social Security benefits. If you retire before you reach the second bend point, you are losing twice as much in Social Security benefits. So the question is when you will reach the second bend point. I created a spreadsheet to answer this question. You enter the year you started working. By default the spreadsheet pulls in the maximum wages covered by Social Security for each year. You can overwrite it with your own earnings history or future estimates. You get your earnings history from the paper statements Social Security used to send out. You can also get them from Social Security’s website if you create an account. My spreadsheet is only for a rough estimate. It covers maximum 35 years of earnings history. It uses today’s dollars for the future, assuming your earnings will keep pace with the national average wage index. The answer for me is that I will reach the second bend point in 2016. That’s about 20 years since I started working full-time. If you had a higher income than I did, you will reach that point sooner, or later if you had a lower income. If you want to know when you will reach the second bend point, try the spreadsheet. Would it be possible to also add a first bend point to your spreadsheet? Would be helpful for those who moved here later in life and don’t have as many working years before retirement or who worked in jobs that don’t pay SS. Also remember it usually requires 10 years of work covered by Social Security. I would think one easily goes over the first bend point after 10 years. So 10 years of low wages followed by many decades of 0’s should still get you past the first bend? Of course it depends on how you define low wages and how a low wage worker is able to retire after working only 10 years. 10 years of $35k a year will get one over the first bend point. 10 years of working in private sector job paying into SS and 30 years in public sector job not paying into SS. In such case the 90% crediting rate becomes 40%, which isn’t much higher than the second stretch. Great post. Can you also do a post on how your social benefits will be affected if you are covered by a pension? I work for a publicly listed company which has pension . I wonder whether my SS benefits will be reduced because of this. It won’t be reduced when the pension is from a private sector employer. What is the age range for the protected age group? I am 40 and my husband is 36, and I’m wondering if we are in that group. Different proposals use different age cutoffs for the group whose benefits should be protected. Age 55 is commonly used. Don’t forget the WEP (Windfall Elimination Provision). It basically reduces your benefits if you work less than 30 years. Its meant to address people potentially covered by other pensions, but in practice it means you can’t have higher earnings for fewer years and get full benefits. In your specific example, working 20 years and trying to claim full benefits, it won’t happen. Your benefit will be reduced by about $400 a month. It basically covers from 20 to 30 years of substantial earnings. It says it applies only if you have a pension based on earnings not covered by Social Security? I don’t have such pension. This is the first I’ve heard of the WEP limiting benefits other than pensions. What is your source? Cool spreadsheet! It said that my husband hit the second bend in 2007 and I hit it it 2012. That’s what I expected, since I had previously played around on a calculator and was very disappointed to see how little my SS benefit would go up by working more years — even at the max contribution! Basically, we can stop working now at 52 and 48 years old, and as long as we wait until full retirement age to collect, our benefit changes very little. I added on two columns to your speadsheet 1) to show the incremental $ increased in the PIA year-over-year 2) to show the % increase YOY. Whereas between bends 1 & 2 you are going up by 6% or so, once you hit the second bend, it is more like 2%. i notice you use zoho spreadsheet. would you please tell me how you compare this with google spreadsheet? I need to let the public enter their own numbers and play with it interactively but still not affect my master copy. I couldn’t figure out how to do that with Google spreadsheet or Microsoft’s Office Online. It seems either the spreadsheet is read-only (no playing) or the changes are saved (the next user sees your inputs). Maybe there is a way; it just wasn’t obvious to me. If you don’t have this requirement, Google spreadsheet and Microsoft Office Online work just fine. age 70, your payment would be about………. age 62, your payment would be about………. My question is this- is there a calculator out there that could show me how much I would receive at age 62 if I stopped working now (age 52) verses working at my current rate until age 62. What does PIA stand for on the spreadsheet? Primary Insurance Amount – The amount you would get if you start your benefits at full retirement age. If i retire early, but go back to work later, do i get credit for the additional SS i pay in? If you haven’t worked 35 years, yes. If you already worked 35 years, it depends on how much you earn relative to what you earned previously indexed to inflation. Could you please comment on it? Q: When you hear people discussing various Social Security reform proposals either to scrap or lift or adjust the cap on covered earnings, what are your thoughts about how you could calibrate those two sides of the equation? A: Our office does estimates for policymakers on all kinds of changes, and as the actuaries, we are completely agnostic as to what would be the appropriate thing to do. A fairly popular proposal that has been put forth is to raise the taxable maximum just enough to get back to having 90% of all earnings covered under Social Security. A: That would be a little more than double our taxable maximum of $118,500–it would rise to around $240,000. Most proposals that have suggested this would do it on a very gradual basis. For example, the Simpson-Bowles commission proposed that, each year, when we index up that taxable maximum by the rate of growth in the average wage, we add an extra 2% to that growth rate until we get to the point where we are capturing 90%. That would take about 38 years. Q: And that has been a general guiding theme in most changes to Social Security–they have been introduced in a very graduated way. A: Absolutely. For instance, the increases in the full retirement age were phased in in a very graduated way; it’s the poster child for gradual. It was enacted in 1983 and didn’t even start to have any effect until the year 2000. Changes to the program have been gradual from one generation to the next; that has always been the case. Just the quoted paragraphs don’t seem to have much impact on the topic in this post. If they raise the cap but still keep the same bend points, you just pay more in SS tax but you still only get credited at the low rate. I will go read the full interview. According to the existing calculations, even if you “front load” the income by reaching the cap every year for fewer years, you reach the second bend point. So if they doubled the cap, wouldn’t high earners reach the second bend point that much sooner? Is there a cap on how much SS benefits can be reduced due to work, or if you make enough will they take it all?? Can you better explain this concept? If one has a career of 35 years making $50k which is a respectable salary, they are still going to be nowhere near the 2nd bend point, what benefits are they “losing”, I guess, in comparison to what? It seems the like the first bend point is really the most meaningful one as you are getting a lot more benefits for the income that is earned. “Losing” as in “not earning” is the opportunity cost of voluntarily retiring early. For each $3,500 in earnings your $50k/year person gives up by retiring early, his or her Social Security benefits are reduced twice as much as another person whose earnings and work history put it above the second bend point. If you would go above the second bend point only if you continue working but you decide to retire before such point, for each $3,500 in earnings you give up, you reduce your Social Security benefits at a rate twice as high as if you retire after you reach the second bend point. Unless I have corrupted the spreadsheet, it is impossible for a 50k/yr person to hit the second bend point because you do not get additonal pia for working more than 35 years. in other words, 35 years at an inflation adjusted 50k does not add up to the 5.5k PIA needed to hit the current 2nd bend. That’s true. That’s why the comparison is with another person with higher earnings who is able to reach the second bend point. You don’t see a lot of people earning $50k retiring early unless they have a pension. Losing too much in Social Security benefits could be one reason. In the spreadsheet, do I enter $118,500 for 2015 if my income was actually higher? I wasn’t sure if needed actual income or capped income(subject to SS tax). This is great to know when you’ll the second bend point and so paying SS taxes is far less valuable. But I don’t really get a sense of how valuable it is to keep working until you hit that point. What does the “32%” mean? To answer my own question – 32% is multiplied by your AIME (average indexed monthly earnings) to get your PIA. So if I understand correctly, up until 35 years of earnings, earning $1 increases your AIME by $1/(35 * 12) = .238 cents. Then up until the second bend point, that is multiplied by 32%, meaning your PIA increases by .076 cents. Another way to put it is that working one year at the max (as in the article) SS taxable income of 118,500 adds $90.28 per month to your PIA.